There is nothing better than hot, homemade french fries, fresh out of your oven or fryer. 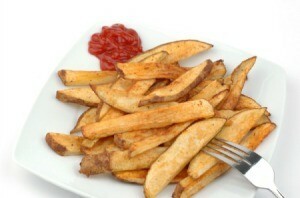 This page contains homemade french fries recipes. I didn't believe until I tried it. Cut Yukon Gold potatoes into 1/4 inch fries, put in 4-qt. kettle, pour peanut oil over, adding bacon fat for extra flavor. Bring to full rolling boil. Set a timer for 15 minutes. Do not touch the fries during this time! After 15 minutes, using tongs, stir gently to remove the ones that may be sticking to the bottom of the pot. Continue boiling for another 7-10 minutes. Drain on paper towels and salt while hot. The Yukon Golds work because they hold together the best and they do not need to be peeled because they have a thinner skin. I think I'd heard about this before, but last night I tried it for myself. I love french fries, but only indulge rarely. When I made them at home, rather than using a frying pan, I'd put about 1/4 cup of veggie oil in a plastic bag, add the cut up potatoes, coat them thoroughly and then put them on a baking sheet in the oven. Not any more! I cut them up as usual, put them on the "release" kind of Reynolds Wrap, and sprayed them lightly with Pam Olive Oil spray. Not a lot. Only a couple of seconds total. Then I turned them over and sprayed the other side. I cooked them at about 375 degrees F. (my oven thermometer is a little cockeyed) for 20 minutes, pulled them out and flipped them over and finished cooking them for about 15 minutes. Take them out when they're crispy enough or brown enough for your own taste. They're great! No guilt, no cleanup because they're on the foil, and they can be tucked away in the refrigerator if you make extras and will reheat nicely in the toaster oven for about 5 minutes. Imagine, low-free fries! Just wanted to pass it along. Much better than potato or macaroni salad, because there's no mayo. Just cut up an uncooked potato into strips that look like fries. Toss them in olive oil and flavor with salt and pepper. Put them on cookie sheet to bake for about 6 minutes and check. It may take a total of 10 to 15 minutes but you have good and cheap fries.